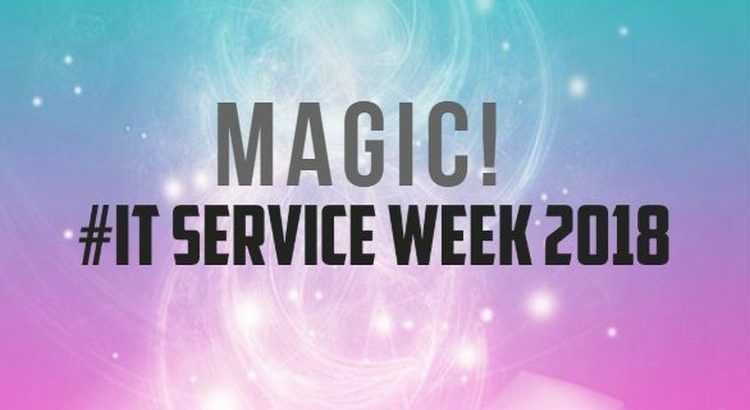 IT Service Week is coming…. WE NEED YOU to support us and join in the crazy as well as maybe VOTE FOR US in the Service Desk Institute’s Survey..? You can vote for the whole Information Centre team or your favourite analyst. We really appreciate your support. Magic Monday – visit the transformed Information Centre in the Library. A service desk will become a magical paradise…(or more likely have some fairly random Harry Potterness going on). Treat Tuesday – IS are holding a MacMillan coffee morning in S10. We’ll be baking (or buying!) magical cakes and sharing them with our colleagues. All welcome. Thanks for reading 🙂 And thanks for being the lovely staff and students that we deal with everyday.